Service-oriented architecture (SOA) and web services were hot developer trends a decade ago but may only get a yawn today. 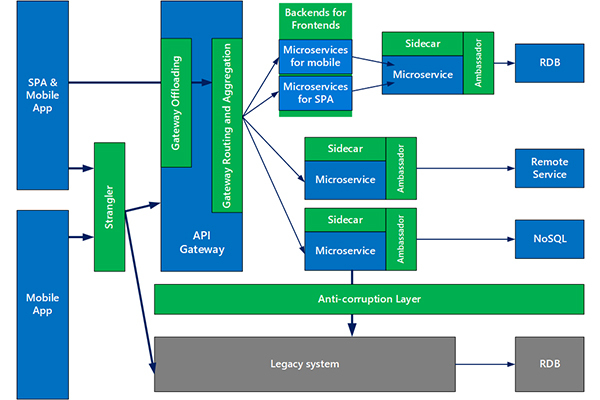 Now, microservices take the concept into the cloud and container era. Microservices and containers are growing in popularity because the modular approach is better suited to today’s dynamic business needs than older programming methodologies with zillions of lines of code. If you want to take a deeper dive into microservices as well as containers, there are resources available to help you get up to speed. Visual Studio users working with .NET can download a free 340-page eBook from Microsoft, .NET Microservices: Architecture for Containerized .NET Applications. Reading and digesting 340 pages of material is going to be a challenge. The authors offer some Key Takeaways to provide Microsoft’s overview of this way of doing application development. As one of the major contributors to the open source container project, Microsoft is pretty much all in with Docker when it comes to microservices architecture. “Docker-based containers are becoming the de facto standard in the industry, supported by key vendors in the Windows and Linux ecosystems, such as Microsoft, Amazon AWS, Google, and IBM. Docker will probably soon be ubiquitous in both the cloud and on-premises datacenters,” the eBook authors write. But you don’t have to take Microsoft’s word for it. On its website, Docker is touting Forrester Research Inc.’s latest take on the technology, New Wave Enterprise Container Platform, Q4 2018 Report. Docker “leads the pack with a robust container platform well-suited for the enterprise,” the container company says. “The purpose of Docker is to build containers that hold, potentially, all of the components of an application: the application itself, the database engine, any Web services it requires and so on. That container, unlike a virtual machine, doesn't require an operating system so it takes less space than a VM and starts up/shuts down faster,” explained Peter Vogel, in a recent Visual Studio Magazine article, Understanding Docker Vocabulary. Kubernetes, first released in 2015, is an open source container orchestration system developed by Google but also championed by Microsoft. The article explained that Kubernetes is the Greek word for helmsman or pilot. For non-Greek speakers who have trouble pronouncing the name, Otey said “Kubernetes is sometimes referred to as K8S, where the eight letters of ubernete are replaced by the number 8.